Former Scotland captain Al Kellock has teamed up with a number of English and Welsh rugby legends to help develop stronger local rugby clubs. Kellock, from Bishopbriggs, and Mike Blair, another ex-Glasgow Warriors and Scotland star, have joined Welsh players Tom Shanklin and Stephen Jones and England’s Lewis Moody, Martin Corry, Neil Back and Maggie Alphonsi to form The Rugby Force. The aim is for the team of rugby legends to offer grassroots clubs across Britain the chance to receive genuine support and advice at their Royal Bank RugbyForce weekend celebration on August 12 and 13. 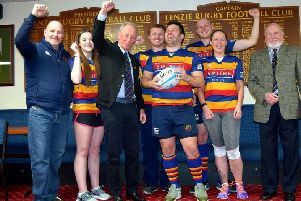 Now in its fifth year, the community initiative run in partnership between Royal Bank and Scottish Rugby aims to help clubs attract new members and to become stronger and more sustainable clubs. The rugby icons will offer their specific knowledge and expertise in the game to help their selected clubs achieve their specific development goals in two key areas. Former Scotland and Glasgow Warriors captain Al Kellock returns to Royal Bank RugbyForce this year following his successful spell as honorary board member at Annan RFC. Al worked with Annan RFC to develop their commercial revenue streams by running a sponsorship workshop with key committee members. Al also attended a fundraising dinner with the club which raised over £3,000 for Annan’s development fund. Al will be providing expert business advice to a winning club, while former Scotland scrum-half and current Glasgow Warriors coach Mike Blair will be giving coaching support to develop coaching best practice to benefit the whole club’s coaching structure. Speaking on set at the launch of Royal Bank RugbyForce, Al Kellock said: “I am delighted to be involved with Royal Bank RugbyForce again this year. Kellock won 56 caps for Scotland between 2004 and 2013.